An unusual "astro-detective" investigation came to a successful conclusion today, when a long lost planet in the solar system was finally found again. This planet which carries the name "MALLY" and the number "1179" had been missing for 55 years, and was last seen in 1931. 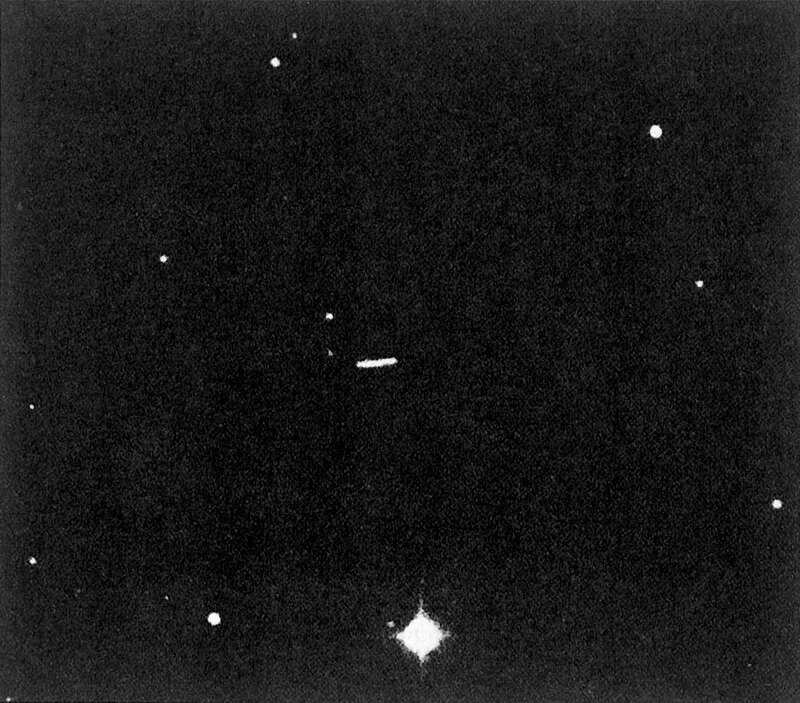 Its faint image was now identified on photographic plates obtained with the ESO Schmidt telescope during a dedicated search programme. The accurate orbit of MALLY in the solar system  has now been determined, ensuring that MALLY will never be lost again. This work was carried out by Drs. Lutz Schmadel of the Astronomisches Rechen-Institut in Heidelberg, FRG, and Richard M. West of the European Southern Observatory. In addition to the nine major planets in the solar system (Mercury, Venus, Earth, Mars, Jupiter, Saturn, Uranus, Neptune and Pluto), there are numerous minor planets (asteroids), most of which move in elliptical orbits well outside the Earth's orbit. A few cross the Earth's orbit and may possibly collide with the Earth in a distant future. By late 1986, more than 3500 minor planets, with diametres from a few hundred metres to several hundred kilometres, have been registered and given a number. Their orbits have been determined with great precision, so that their positions in the sky are well known at all times. Most of them have also received a name by the astronomers who discovered them. Unfortunately, a few of these planets have "disappeared" in the meantime. Minor planet "(1179) MALLY" is one of these. It was discovered on March 19, 1931 by Karl Reinmuth, Staff Astronomer at the Landessternwarte Heidelberg. 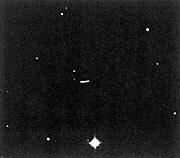 He first saw the image of MALLY on a photographic plate, exposed at the 72 cm reflecting telescope and showing a sky field in the constellation Virgo (the Virgin). He measured MALLY's positions on this and some other plates which were obtained until May 13, 1931. From these measurements, it became possible to compute MALLY's orbit in the solar system; it then received a number and Reinmuth gave it its current name (the meaning is not clear). By chance, nobody observed MALLY during the following years and when an attempt was finally made in 1936, MALLY could no longer be found. Apparently, the orbit which was computed in 1931 was not very accurate and, as an exceptional measure, the International Astronomical Union officially had to declare MALLY as "lost". In order to solve this long-standing problem and to find MALLY again, Schmadel and West first remeasured Reinmuth's photographic plates with modern techniques, achieving a higher accuracy than what was possible in 1931. A new, more accurate orbit was computed and MALLY's predicted positions in the sky from 1931 to 1986 were determined. Due to the unavoidable, great uncertainty in this prediction, MALLY could still be anywhere within a large sky area by 1986. A substantial number of photographic plates that had been obtained with various telescopes during recent years, were therefore searched, but no images of minor planets were found which could be identified with MALLY. The catalogue of all registered observations of minor planets (more than 400.000) was checked but none belonged to MALLY. Finally, it was decided to obtain new photographic plates of the sky region in which MALLY was expected to be seen in early 1986. These plates were obtained by Hans-Emil Schuster, ESO Staff Astronomer, with the ESO Schmidt telescope in March 1986. Almost 100 images of minor planets were identified on each of these plates. Extensive computations showed that one of these images might be MALLY. A new orbit was computed, based on the positions from 1931 and the assumed one from 1986. This new orbit indicated that images of MALLY should be visible on three other ESO Schmidt photographs, obtained for another astronomical research programme in December 1979. And indeed, such images were found at the expected places. Finally, Schmadel and West also found MALLY images on two plates taken with the Schmidt telescope on Mount Palomar, California, USA, in 1952 and on one plate obtained with the SERC Schmidt telescope at Siding Spring, Australia in 1983. All this evidence definitely proves that MALLY has been found again, after having been missing for no less than 55 years. With the recovery of MALLY, only five minor planets are still "lost". They are "(473) NOLLI" (last seen in the year 1901), "(719) ALBERT" (1911), "(724) HAPAG" (1911), "(878) MILDRED" (1916) and "(1026) INGRID" (1923). MALLY's main data: Approx. diametre: 7 kilometres; Approx. weight: tons; Mean distance from the Sun: 390 million kilometres; Orbital period around the Sun: 4 years and 84 days. Its orbit lies between the planets Mars and Jupiter.